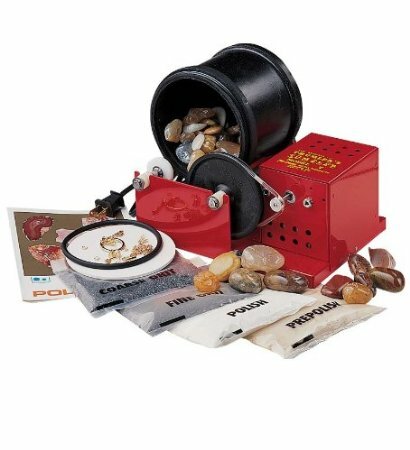 Discover the art of rock polishing and get started on the right foot with the complete Thumler's Tumbler Rock Tumbler Kit. This kit is based on the impressive Thumler's Tumbler with a three-pound capacity barrel, ideal for small batch and jewelry polishing. You'll get all four grades of polishing grit, even some sample stones and jewelry findings to make your first experience a perfect one. The illustrated Rock Polisher's Guide will inspire your imagination as you move on to your own style. Thumler's Tumbler products are extensively used by serious hobbyists, laboratories, schools and industry for an unlimited variety of tumbling and mixing operations. Their kits include the polishing machine, media and a professional guide and their polishing products come with a guarantee on the barrel and the liner.